Looks like the Everblades swept the Gladiators! The game was good and bad. It was really slow as far Offense goes. I believe there were 22 shots total after 2 periods. Atlanta played to win, had an edge, and laid the body on everything that moved. Florida was in ‘meh’ mode until the third. Atlanta couldnt create any separation. Florida’s PP wasn’t very organized all game. Atlanta had plenty of chances on Florida’s PP. Florida didn’t really threaten on the PP until OT when they won it. Smallman did pretty good. Was aggressive and pushed the tempo. I was surprised to see he wasn’t on the PP. He was on the ice for two goals with at least one assist. He drew the penalty on an aggressive play in OT that led to the series winner. He was one of the more enthusiastic people celebrating after the win. Although I don’t see Kanzig being re-signed, he has the spirit of what our defenders need to be. First he looked huge out there. Second he didn’t take no crap from nobody, and loved to get gritty. Got into a few confrontations with Atlanta players. Unfortunately Booth wasn’t out there but Ouellette looked solid. I’d expect him to be at the ECHL level. They didn’t announce why they waived off the Florida goal. Not a lot of people there but my family and I were rocking ‘Canes gear. Hopefully they noticed. I was only 7 rows from the ice. Our yutes are bringing it! It's really a testament to how well Francis was doing with that part of the rebuild - the 'draft and development' stage. It's kind of a bummer that he won't be around to reap the rewards of what was actually very solid work because these kids he brought in will lead the franchise to very good things over the next couple years, i truly believe - but not being able to make the complementary moves to ensure NHL success in the here and now - along with an impatient new owner who didn't see those moves either - sealed his fate. True. He did the patient rebuild thing and pretty good drafting overall, especially in the second round and later (jury still out on first rounders lately though hopes for Necas are high). Also trading for Zykov and McKeown, still could play a big part. But he has built a pretty good stable of prospects. Thinking back to when Dalpe, Bowman, and Boychuk were the best prospects we had and after them was even worse, we are deep indeed. But he remained a bit of a one trick pony too comfortable with the plan never changing gears to make the big move. In the end though, one thing was his undoing: he could never solidify the goalie position. Eddie Lack was a fail year one, yet he doubled down on him in year two, and then Darling the next year. Had he fixed that position, even unable to get off his trade hands, he might have survived. Martin Ouellette only allowed one goal for the second straight night as he saved 26 of the 27 shots fired his way. Heeter takes the loss, allowing five goals on 35 shots faced. 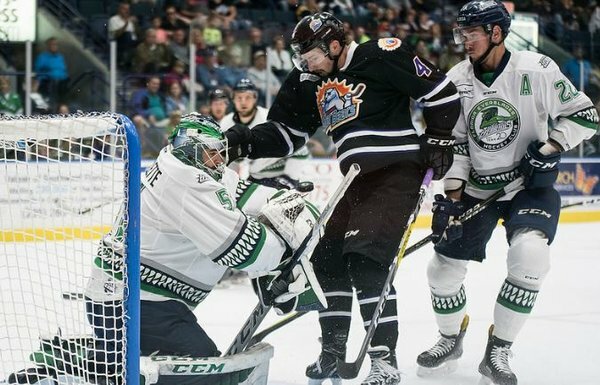 ORLANDO, FL – Michael Kirkpatrick scored twice to help pace the Florida Everblades to a 5-1 victory over the Orlando Solar Bears in Game 3 of the South Division Finals Thursday evening at the Amway Center. Florida now leads the best-of-seven series 3-0. Booth’s ice time has stopped. Wonder why? Yesterday, @slorentz96 tallied an assist and @ssmallman96 added two of his own as the @FL_Everblades defeated the Orlando Solar Bears to take a 3-0 series lead in the #KellyCupPlayoffs Division Finals. The loss snaps a 17-game win streak for the Everblades dating back to the regular season. 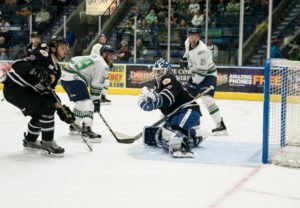 The Everblades will play host to the first two games of the Eastern Conference Finals at Germain Arena on Friday, May 11 . Wow! 8-1 in the playoffs so far? Nice. Looking at their roster I've heard of about 5 of them, but still nice to see. Very cool! Though of course the reason we've only heard of about 5 of them is that only about 5 of them are Canes property. Even so, it's a winning culture for those 5. Michael Kirkpatrick sent Germain Arena into a frenzy when he stole the puck while shorthanded and rocketed down the ice on breakaway chance. As a Thunder player tried to keep the puck in the zone, he slipped and fell to the ice and set Kirkpatrick up on a breakaway opportunity. Kirkpatrick cut across the crease on his backhand and lifted it over the pad of Fielding for the tally to regain the lead at 3-2. Ouellette earned the win stopping 31 of the 34 shots fired his way, while field allowed four goals on 35 shots faced. 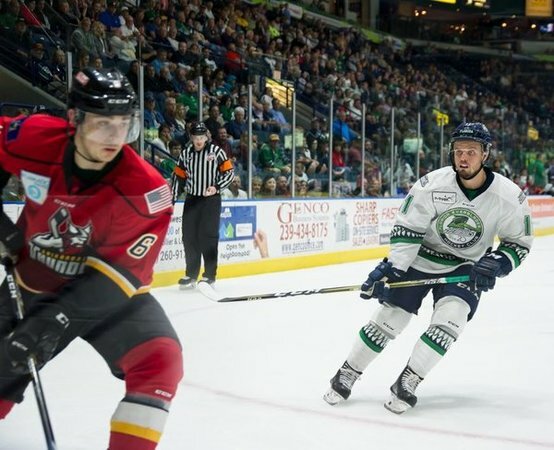 ESTERO, FL – Terrance Wallin scored at 16:50 into overtime, while Drew Fielding made 52 saves to propel the Adirondack Thunder to a 3-2 victory over the Florida Everblades in Game 2 of the Eastern Conference Finals Saturday night at Germain Arena. The best-of-seven series is now tied 1-1. Martin Ouellette stopped 25 of 28 shots in the loss, while Drew Fielding made a whopping 52 saves on 54 shots faced. GLENS FALLS, NY – The Florida Everblades scored three power play goals to help earn a 7-3 victory over the Adirondack Thunder in Game 4 of the Eastern Conference Finals at the Cool Insuring Arena Friday night. Florida now leads the best-of-seven series 3-1. Even in ECHL ex-Canes come back to haunt us. 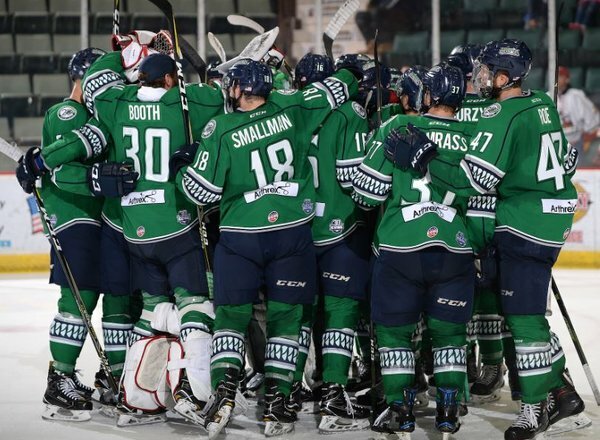 LOVELAND, CO – Mitchell Heard’s dazzling goal with 36 seconds remaining in regulation, propelled the Florida Everblades to a 4-3 victory over the Colorado Eagles in Game 2 of the Kelly Cup Finals at the Budweiser Events Center Sunday night. The best-of-seven series is now tied at 1-1.